Most of the photos below are from our house back in Virginia. We are now living in Texas, but enjoyed our time in Virginia and loved giving this house style! The guest room was transformed into a comfortable space using several things I already had around the house and a few easy, DIY projects.... read more here. 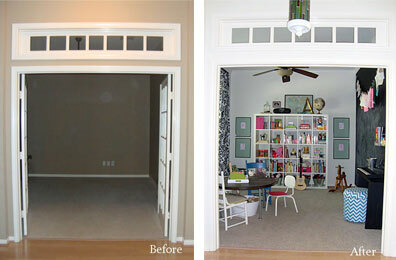 The look of the front entry way was dramatically changed with the simple use of washi tape. 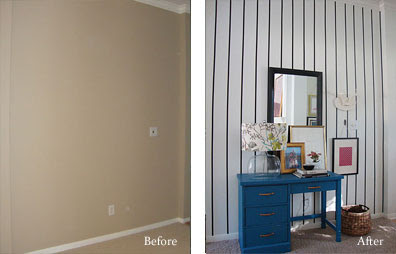 Those stripes went up really quick and could come down just as quick.... read more here. The kid's play area is always the most fun to decorate.... so much space for color and creativity, read more here. The girl's requested a lot of pink for their bedroom. 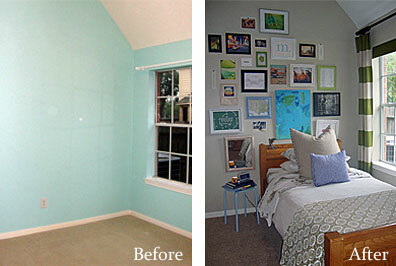 This bedroom definitely has a lot of pink.... from the ceiling to the floor, read more here. This was the first room completely decorated in our TX house.... my son's bedroom. 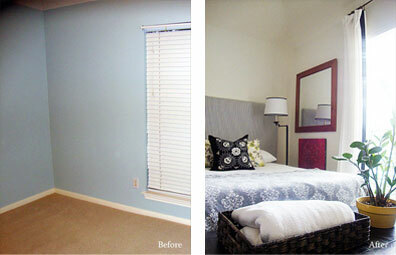 I wanted to personalize his room, reflect his interests and of course make it comfy. He loves the result (and so do I)... read more here. This was the living room in our house in Virginia. We painted the fireplace and walls, removed the window treatments, and did a lot of decorating... read more here. This was the kitchen in our house in Virginia. The kitchen was in need of an upgrade when we moved in... and paint did the trick. We painted all the knotty pine cabinets a creamy-white color, painted the peninsula black chalkboard for the kids, painted the ceiling a greenish-blue color, removed a few cabinet doors, and painted the back door a shade of black for some contrast.... read more here. This was the front door entry in our house in Virginia. 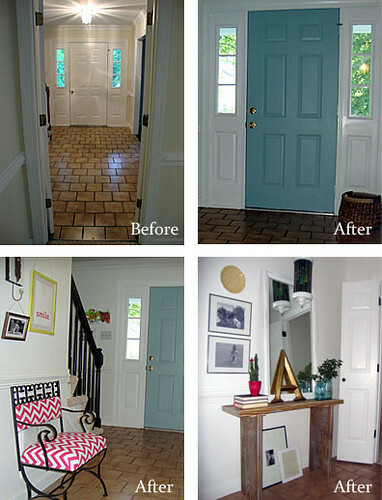 It was kinda bland when we moved in, so I immediately painted the front door a bold color and added some other shots of color with the chevron printed chair and smaller decorative items. This was our dining room in Virginia. The walls were painted a taupe-y color, the ceilings and trim were painted a crisp white and I spray-painted the chandelier a bright white. The window coverings were replaced and I recovered the seats with a striped fabric and made a slipcover for the top of the chairs with a floral fabric. The splash of pink in the chairs help to bring some color and fun to the room. This was one of the guest rooms in our Virginia house. I had a girlfriend coming to live with us for a summer, so I really decorated this room with her in mind... read more here. This was the other guest room in our Virginia house. My brother-in-law was visiting us from Spain for a few months, so I designed this room specifically for him. Read more here. 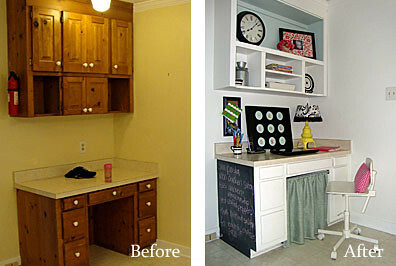 This was an area in our kitchen that I designated as my "Mom Space"... read more here.